We love the terrazzo look! 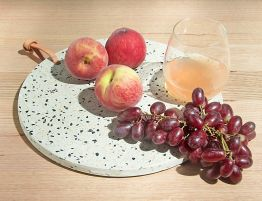 A mesmerising piece that will flourish on your kitchen bench, the Terrazzo Board is perfect for serving and makes a fun and easy way to both move and present foods and snacks. In addition, this decorative board can also simply be used to hold other objects and can easily be stored with its stylish leather loop.